Close-up view of young stylish woman with suitcase standing on the escalator. 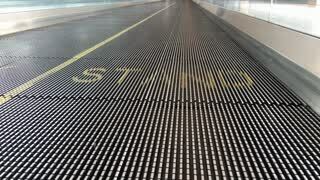 Feet of attractive female on the airport. 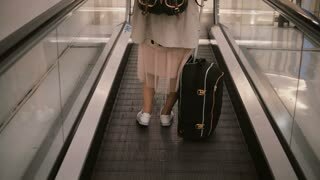 Close-up view of young woman with suitcase standing on the escalator in airport. Hipster female ready to going to trip. Young traveling couple in raincoats standing on the shore of the sea and enjoying the trip. Tourists man and woman.